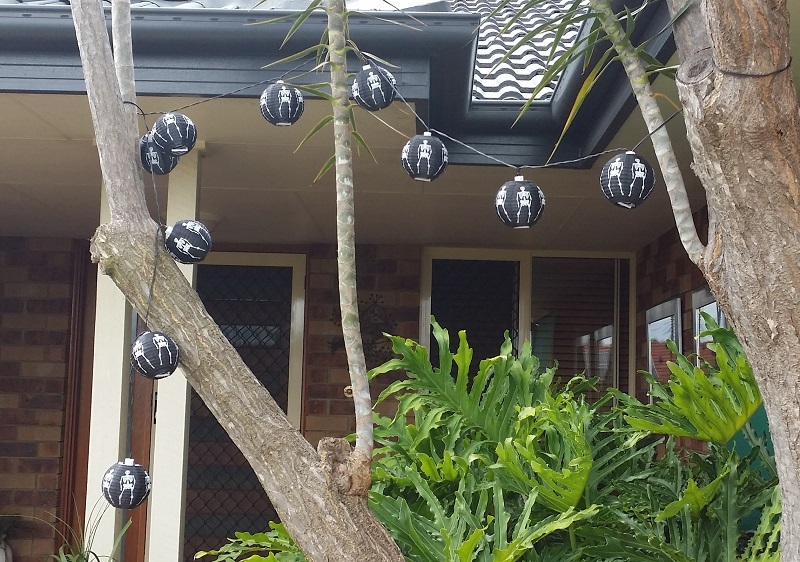 I only decided to do Halloween 2015 about half way through October. 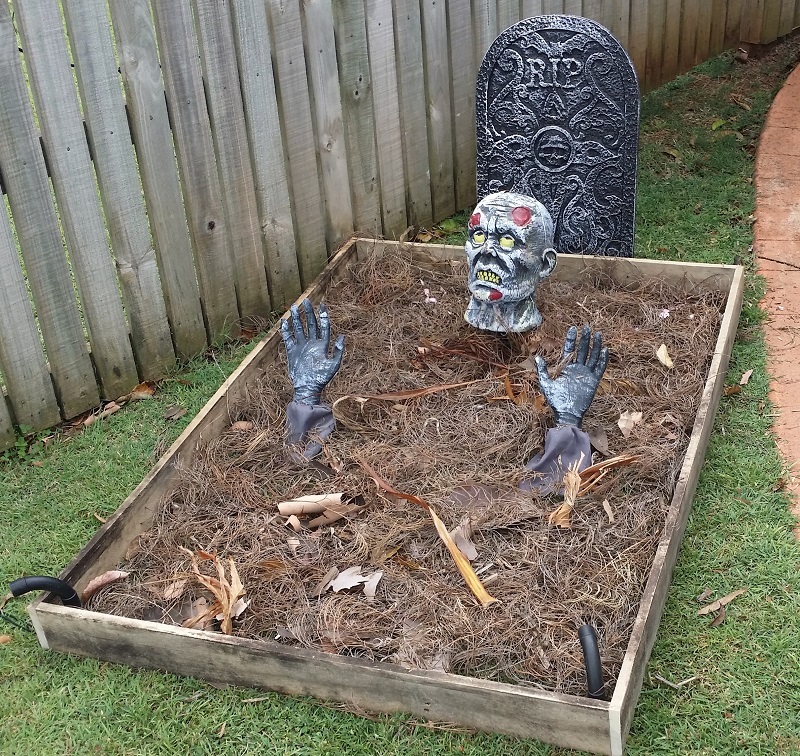 Some items were bits I bought in 2014 when they went on sale after Halloween. 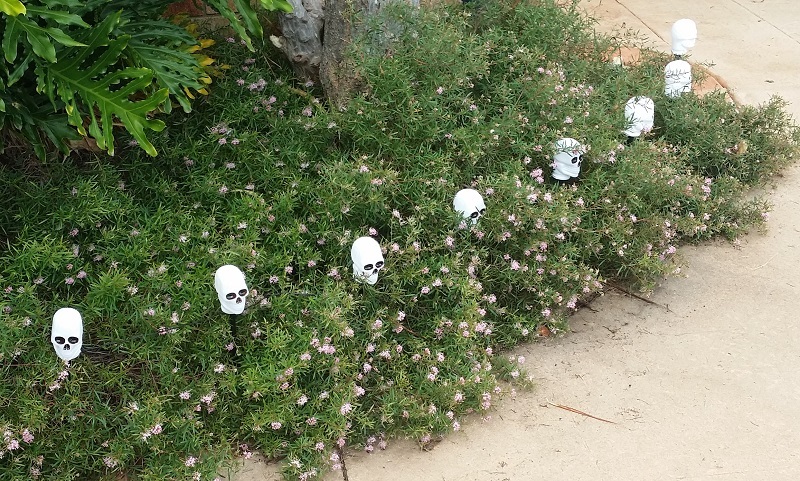 These skulls were originally 2 sets of 4 solar lights. The original white LEDs were replaced with colour changing types. I joined them together, added a resistor and zener diode for 12V operation. 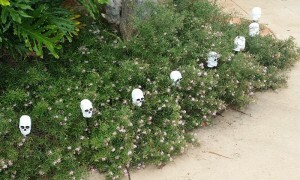 The skulls looks great at night. A couple of people asked where I bought them from. 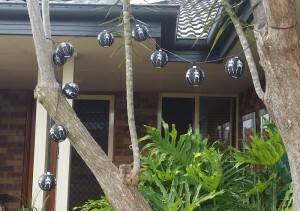 These LED lanterns were originally solar. They now run from 12V and a central power supply. 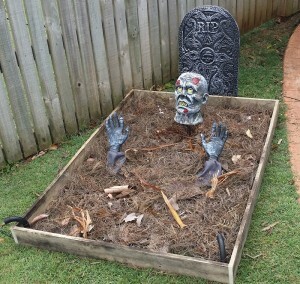 The zombie grave was a last minute idea. A few bits of recycled timber (pallets) made a quick frame. The headstone was from a Big W pack. Some dead tree leaves filled up the frame. One of my cheap LED spotlights highlights the scene. 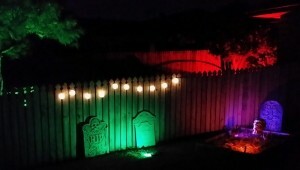 A couple more headstones and some LED lanterns. The little LED spot lights worked well. I also used a couple of 10W RGB floods under the trees set to static colours. 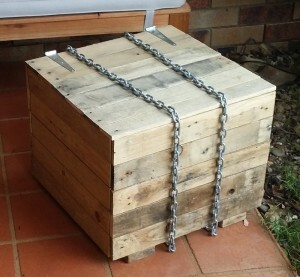 This monster crate is made from old pallets. A car door lock actuator bumps the lid randomly when someone walks past. The chains rattle with the lid banging. 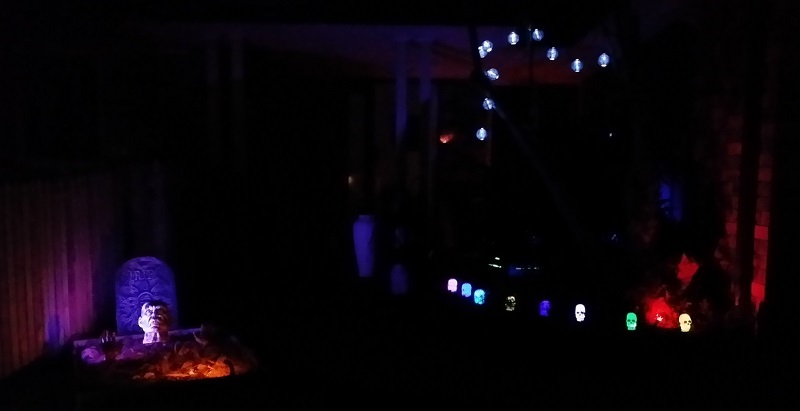 A string of RGB LED modules were thrown inside to change colour when it activates. I ran out of time to add some stenciled text to it. 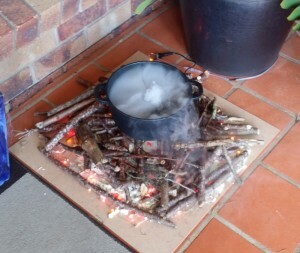 Next year I hope to add some monster sounds. 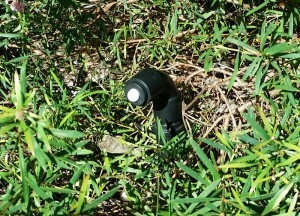 This is the PIR sensor to trigger the monster crate. 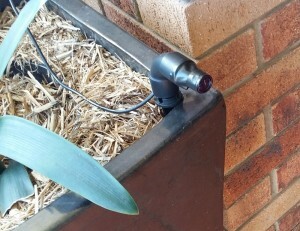 It’s mounted on a spike in the garden just before the crate. I’ll describe how to make this from eBay parts in due course. 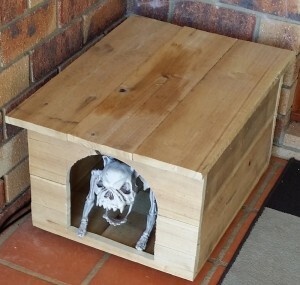 This dog kennel was another rough and ready pallet wood project. The skeleton dog was from an eBay seller. I removed the battery / speaker box from his head and added a cable for the eye LEDs. A control board now powers the original electronics and interfaces to a sensor. The speaker output of the original board was wired to a larger speaker that sits at the rear of the box. A future version of this prop may see the jaw animated with a small servo. 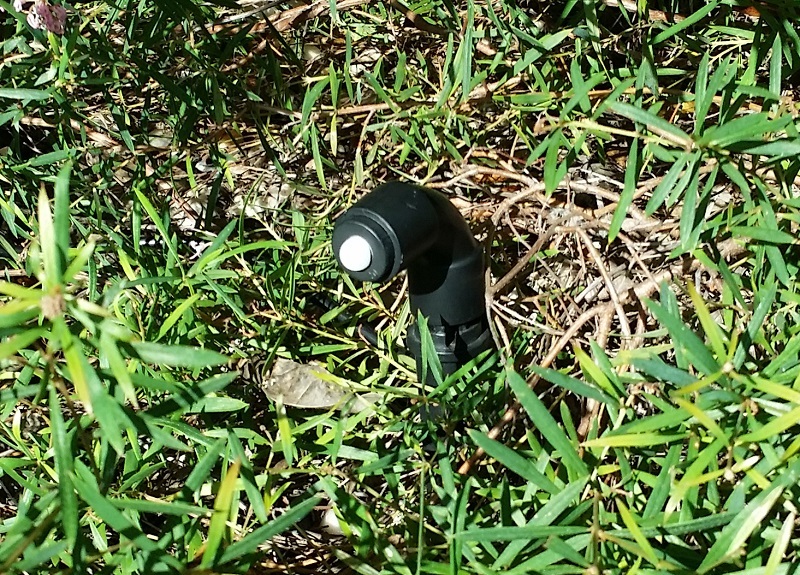 The PIR I was going to use for this prop was intermittent so I grabbed a IR proximity sensor. This sensor has a limited range (~ 80cm) so I had to position it close to the visitor’s path. Overall the yard and patio are were fairly dark. Next year I’ll add a little more background illumination, especially near the patio step.